President Vladimir Putin has ordered Russia’s military to begin developing new medium-range missiles in response to President Donald Trump’s announcement that the United States is leaving a key Cold War nuclear arms treaty. Putin announced that Russia was also suspending the Intermediate-range Nuclear Forces, or INF treaty, a day after the U.S. said it was pulling out of the 1987 agreement over alleged Russian violations. At a televised meeting with his foreign and defense ministers, Putin ordered his military to begin developing new ground-launched hypersonic missiles with an intermediate range, and to also begin converting previously sea-based cruise missiles for ground launch -- the deployment of which was banned under the treaty. 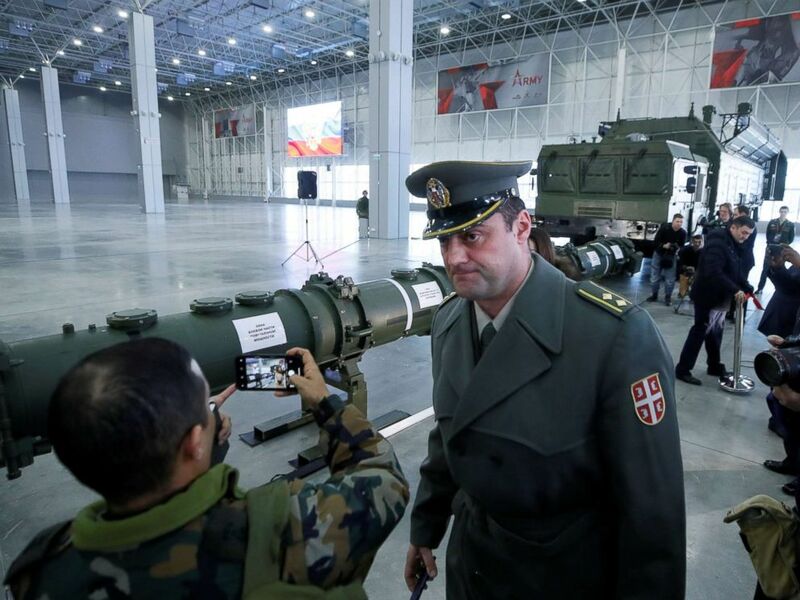 Journalists and military attaches attend a news briefing on cruise missile systems including SSC-8/9M729 model, at Patriot Expocentre near Moscow, Jan. 23, 2019. But Putin said Russia would not deploy the missiles unless the U.S. deployed its own. The INF treaty, which was signed by then-President Ronald Reagan with Soviet leader Mikhail Gorbachev, banned Russia and the U.S. from developing ground-launched missiles with a range between 310 and 3,100 miles. It removed part of the specter of nuclear attack that then hung over Europe and is seen as having helped build the trust between the two enemies that eventually led to the end of the Cold War. Trump in a statement on Friday announced the U.S. was suspending its compliance with the treaty and said it would withdraw altogether in six months unless Russia came back into compliance. The U.S. for years has accused Russia of secretly developing a cruise missile with a range that violates the treaty, something Moscow has always denied. Russian President Vladimir Putin chairs a Security Council meeting in Moscow, Friday, Feb. 1, 2019. At their meeting in the Kremlin, Putin asserted the U.S. was already developing missiles in violation of the treaty and therefore Russia would do the same. He approved a proposal by his defense minister Sergey Shoigu to also begin converting Russia’s Calibr cruise missiles -- which are currently sea-based due to the INF treaty’s restrictions -- so they can be launched from land too. Putin’s comments will stoke worries that the U.S. and Russia may be headed into a renewed arms race. But Putin emphasised that Russia would not deploy the new missiles if the U.S. did not. 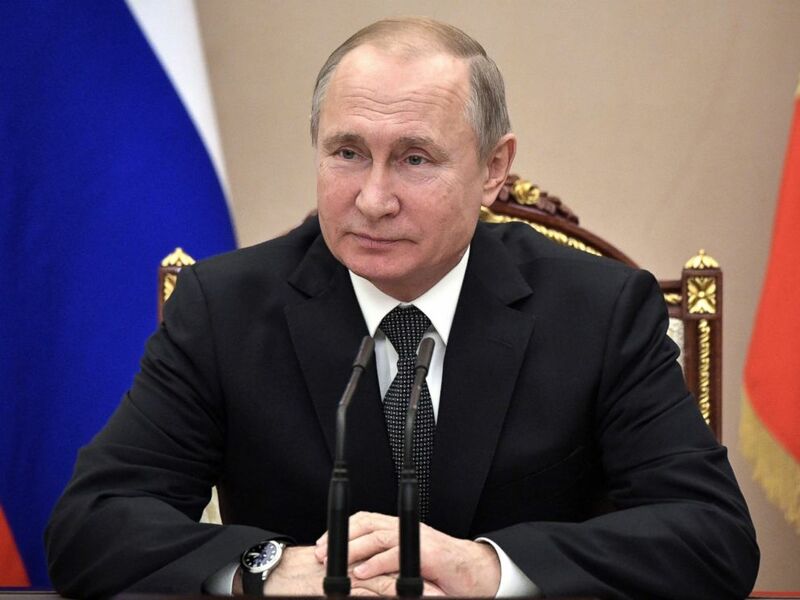 “We start from the position that Russia will not deploy, if these missiles appear, neither in Europe nor other regions of the world, weapons of intermediate range so long as in the corresponding regions of the world similar weapons of American production do not appear,” Putin said. Trump administration officials, however, have previously said warnings that leaving the treaty risks a new arms race ignores that Russia has already developed and tested a missile that violates the treaty. "When an agreement is so brazenly disregarded, and our security so openly threatened, we must respond," Secretary of State Mike Pompeo said at the State Department when he announced the withdrawal on Friday. Russia denies its missile, the 9M279, is in violation of the treaty. The U.S. has already been conducting research on intermediate-range missiles in response to Russia’s alleged banned missile. Research and development is permitted by the INF treaty, provided there is no flight testing, and the Trump administration has said it would end the research if Russia returned to compliance. U.S. officials have previously said the missiles remain at an early stage and that deployment is not imminent. But European countries, arms control experts and critics from both parties on Capitol Hill have expressed alarm at the U.S. exit, fearing it puts Europe under threat. Sen. Bob Menendez, the top Democrat on the Senate Foreign Relations Committee, said the Trump administration "lacks a coherent strategy to address the threat new Russian cruise missiles pose to the interests of the United States and those of our allies." Some analysts believe the U.S. is more likely to deploy the missiles in Asia to counter a rising threat from China. Although Trump administration officials in their statements Friday focused on Russia’s violations, in reality many experts believe the White House’s desire to leave the INF treaty has more to do with China. American officials, and also some Russians, view the treaty as outdated in that it ties Russia and the U.S. from developing missiles, which China -- not restricted by treaty -- has already deployed on a large scale. In a visit to Moscow in November, National Security Adviser John Bolton, who has driven the push to leave, told Russian reporters that even if Russia destroyed its missiles China would have to as well if the INF treaty was to be saved. The beginnings of an arms race beyond the scope of the treaty have already seemed to appear. The U.S., Russia and also China have begun to develop hypersonic missiles and other new-generation weapons. 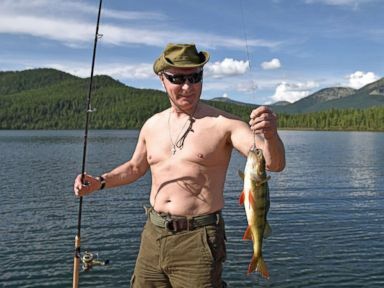 Last March, Putin touted an arsenal of doomsday weapons he said Russia was developing, among them nuclear-armed underwater drones and also a hypersonic cruise missile.